Well, with the weather turning toward winter weather I am getting to spend a little more time indoors and that means sewing time. I always seem to have a hard time getting excited about a project and getting in the sewing groove after such a long break, but I started by organizing what I already had going and that was all I needed to get back in the sewing groove and now I am excited to get going again. I jumped right into the ‘ABC for Ewe and Me’ again, determined to catch up which I thought would be a real challenge since I am about 5 months behind, but I finished up month 5 in a day and started month 6. While looking at that basket block which is ’N for Nancy’s basket’ I got inspired to try something new to me and use felt for the flowers and leaves. Good call! It went fast and I sure enjoyed the process. There is so much fusible applique on here that I am going to have to get more Steam A Seam lite real soon. I thought I should look for a roll….well, found it on Amazon for over $100, don’t think I need quite that much, but it sure would be nice to have on hand. It seems to be the only adhesive that doesn’t gum up my needle when I sew on it which causes a lot of frustration. The next fun little project I started inspired by a link from Pinterest for the little house block. 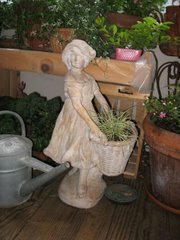 Now I tried to jump on the bandwagon for the little house project a year or was it two ago, but had found it difficult. This time I found a link to the foundation piece patterns which come in 3”, 4”, 5” and 6” blocks. I picked the 4” blocks and then did some log cabin strips around them and rounded off the corners to make some hot pads. I like to make my hot pads extra thick so my quilt sandwich for a hot pads goes like this: backing, batting, insul-brite, backing, and top. It is thick but, not stiff and this method has made some of my favorite hot pads guaranteed to keep your hands from getting burned. I was making this runner for a friend who recently got married, when I got to the quilting though I thought it would be easy and I would finish it in an evening…well, that was not the case. I tackled the pebble stitch for the sunflower centers with no problem and actually enjoyed them, but when I got to the petals my tension was all off and I couldn’t decide what color thread to use on the light colored back. I am now thinking I should have made the backing a dark color so I wouldn’t be stressing so much about the dark threads showing up on the back. I learned through a Janome group I joined on Facebook that my tension should actually be set at about 7 which I thought would be too high, but it really worked. I got frustrated with the quilting on this though and set it aside for another day. Sometimes you just have to do that or you will hate the finished project. So I am waiting for inspiration to strike me again then that project will be finished in a flash I am sure. The piecing was a lot of fun though and I did it with no pattern just the picture from Pinterest. Now that I have gotten back into my sewing groove there are lots more projects I would love to start and some I really want to finish. I think I will be busy this winter. I haven’t been getting much sewing done the last few months between company and gardening I have been too busy to sit at the machine. Summer is winding down and the days are getting shorter though and I am finding a little more time in the evenings to sit and piece a few projects. I am about 4 months behind on my ABC for Ewe and Me BOM, but have found those blocks quick to do so I should be able to catch up before long. Right now though I have been enjoying working on my River Town blocks. I am so glad I had put it all together in a plastic box so it was easy to pick up where I left off. I just had an email from Country Threads saying that they are planning to retire and close up shop so I thought it would be fitting to work on getting this done. I had the pleasure a few years ago of meeting Connie in person at a quilt show in Des Moines and had a fun evening dining and chatting with this talented quilter. I recently placed a nice size order for some fabrics that I think will work nicely in these blocks. Those squares come out to 3/4” finished. I made it all a little stream lined by strip piecing the sections and then cutting them. About a year ago I ordered a lot of patterns from Country Threads when they were having a clearance sale and I am so glad I did. They will also be having sales as they wind down and get ready to retire so be sure to check them out. This project is coming along nicely as I spend about an hour or two in the evening while listening to Bonnie Hunters Quiltville Quilt Cam on my Kindle while I sew. It feels like I am sewing with a friend and sometimes more than one. She is handy with the tech gadgets and is able to read messages from other followers while she is working and chatting. It is so fun to see what others are working on too. Now I need to figure out how to post my projects to her. I learn so much from all the different inputs and it is quite inspiring. I have lots of Quilt Cams to catch up on since I didn’t realize she was doing this. It’s a lot of fun! Looking forward to fall and winter now with so many fun projects to work on! I am really enjoying the BOM that is going on this year at The Quilt Show. They go pretty fast so I have lots of time to work on other projects while I wait for the next months instructions and the video that shows how to do the new technique that is the new months block. I am using scraps to do this and keep it all in a Art Bin so I can reuse some of the scraps in future blocks to tie it all together in the end. There is a really nice mix of piecing and applique in this and opportunity to try many different techniques. All of the applique has been done with Steam-A-Seam Lite then I am using a button hole stitch to go around them after. I am having lots of fun picking different colors of thread for each one to really accentuate the letters. I am a little behind with all the borders, but knowing it will only take me an evening of sewing and I will be all caught up has me procrastinating I suppose. I also need to stitch around the letters ‘e’ and ‘J’, which will be easier to do before I add the borders. I originally thought I might give this to my Grandson, but I am starting to fall in love with it and don’t know if I will be able to let it go in the end…time will tell. 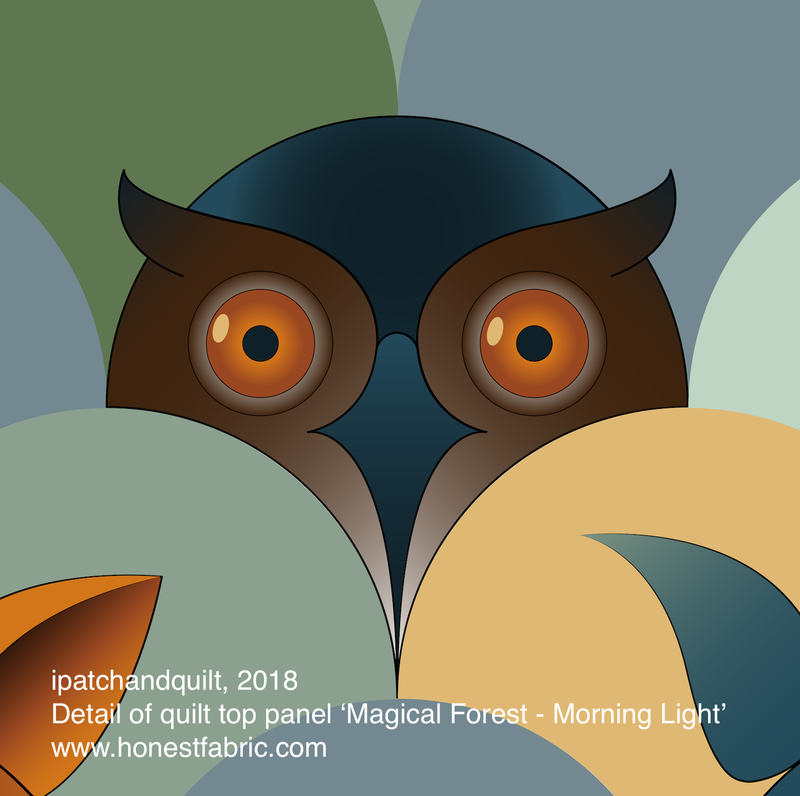 There is still lots of time to catch up if you are looking for a fun project, though The Quilt Show does require a yearly membership fee of $40, but they have wonderful hour long videos that come out about every 2 weeks and lots of sharing of patterns and other quilty tidbits. There is a forum for chatting with other quilters and so much more. I think I have belonged for at least 5 years now and look forward to each new video that comes out. Once you pay your membership you can watch past episodes too so that will keep you busy for a very long time. I have been working on this little project for quite a while and kept putting it away because I was trying to embroider lots of little bees on it and they were not turning out as good as I had hoped. The other night I made the decision to take out all of the embroidery and try playing with coloring my bees with crayons. I spent a good hour carefully removing all my embroidery which is not quite as simple as ripping out a seam. Then I ironed a piece of wax paper to the back of the fabric where I wanted to draw a bee, for stability. I used only 2 colors a yellow for the body and a gray for the wings. I then took a piece of printer paper and ironed on top of the colored bees, this melted the wax and the excess was absorbed by the paper. I then used the same black permanent marker that I use to make my quilt labels and drew in all the details. The whole thing took me less than a half hour and I love the results. It should wash and wear well as all my quilt labels have been holding up to lots of washing and the color from the crayon really soaked into the fabric. I also tried my hand at making this little paper pieced bee in the corner which was trickier than I anticipated so I decided to leave it at just that one bee. I have not decided what to do with the other 3 corners, but I just might do some fun quilting in the corners or applique some flowers. I got a crazy idea to make the backing for this table topper from hexagons thus going with the bee theme. It probably took me longer to cut the hexies than to piece them together. I had just watched a Quilt Show episode where this was done and having machine pieced hexies before I decided to give it a go. I love the way this turned out so much I am thinking of making 2 toppers from these instead of sewing them together. I am a little concerned also about quilting through all those seams, but I will give the hexie fabric a good press and starch and then decide. I have had an urge for quite a while to get my scraps in order and under control so I decided to ‘Hop to It’ as Edyta Sitar would say. I started by sorting through all my bins which I have organized by color and pulling out all that small stuff. My sewing table was filled with scraps for cutting up and my drawers are now so neat and tidy. The next step was to decide what size pieces I might want to cut them into so I started with 2 !/2 “ strips and 5” squares, but there was still some smaller fabric left that seemed usable so then I was saving 1 1/2” strips. I found too that I have been using a lot of 3” squares for HST so I starting a 3” pile. I have them all in this one Art Bin, but I think I will be making a bin for each size strip as soon as I can get to Michael’s or Joann’s to pick more up. I cut for hours and still have my old scrap bags to go through, in fact there is a whole drawer under the table full of plastic bags sorted by color. I have decided to sort my scraps by size now and drop the color idea. We’ll see how that works. Well, I couldn’t cut all day without sewing and I had been inspired by a quilt I saw on Pinterest so I figured out the sizes and started sewing strips of different sized together and cutting and ended up starting a quilt that is really going together rather quickly. Before I knew it it was 11:00 at night and I had been there most of the day. I had a blast! I am making the corner squares from the 5” blocks. I started trying to making pleasing color combos then I just went with the scrappy look and worked my way down my stack. I spent more time figuring out the setting corners since I decided to turn it on point til I remembered that I had this handy little reference tool put together by Harriet Hargrove, Alex Anderson, Sharyn Craig, and Liz Aneloski. The plan is to do some fun FMQ in the tan squares. I am also thinking of doing some fun scrappy border so I don’t have a plan yet how big this will be, maybe I will finally have a quilt for my queen size bed which has been a quilting goal of mine for a few years. Boy am I hoping for more rainy days of sewing to work on this! I love the idea of toning things down and simplifying so I am going to try to play along with making these quilt blocks from the APQ quilt-along. This is my trial block and I’m not sure if this is the color scheme I will stick with. The green seems too light and doesn’t show much with my beige background, but it is always fun to do a trial block then go from there. I found this block fun to put together and there are lots of strip sets to make it quick. If I had my color scheme finalized I could whip out a lot more blocks after spending a good evening getting all the cutting done. I love to chain piece and using long strips would really help to get me moving right along. Right now my favorite color way (Plum Sweet by Blackbird Designs) that I am seeing on the internet is the one that Anne Sutton from Bunny Hill Designs is using. If I made this quilt for my bed though it needs to have a blue and/or green color scheme so I’d better do a bit more research. There is even a Pinterest page which is full of inspiration for color schemes and showing the progress that people are already making. Camille Roskelley is really making progress and working with her new fabric line which is giving it a fresh, clean look. Thanks go out to Lissa Alexander for the design of this fun quilt and the Fat Quarter shop ladies for all ideas and enthusiasm they have put into this project. I always look for one block of the month to participate in each year. I rarely get them finished, but the process is fun and I always learn new things. Two years ago I decided that I really wanted to practice my FMQ and followed Sew Cal Gal’s wonderful line up of teachers that each offered some new tips and techniques on free motion quilting, I really got a lot out of that. One year I really wanted to learn to needle turn appliqué and followed Anne Suttons basket quilt, I love that one, but I didn’t get it finished because we moved somewhere in there and I got so behind I didn’t ever get caught up, but I have it all printed out and love stumbling upon the blocks I did finish. Last year I followed Lori Holt’s Quilty Fun row along and never finished that either, but now she has a book to go along with it and lots of projects that I could do something totally different with the blocks I did finish. It all makes me wonder what I would be doing now without all this inspiration from such talented quilters and the internet to help spread it around. Back to quilting! I am making my sewing machine a little dust cover (as if I ever give it a chance to collect dust).